Goal setting could be both the most underrated and overrated tools that can help you to achieve whatever you want in life. Almost everyone was told that if they wanted to achieve outstanding success in life, they need to set goals, is that true? 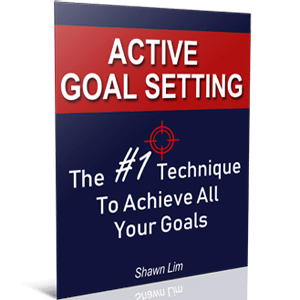 If all the gurus and all the personal development books out there are telling you that you should set goals to achieve the result you want in life, then perhaps it is true that goal setting will help, but to what extend? And how do we set goals? In today’s post, we are going to discover the ultimate guide to setting goal, the step-by-step strategies. If you wanted to learn about the pros and cons about goal setting, read this post, 7 Things You Definitely Want To Know About Goal Setting. Not only that, but I also talked about the disadvantages of it. Check out the article to read more. Now, if you are serious about setting a goal and aiming for the things that you want in life, you have to learn the art of goal setting. Yes, to me, goal setting is an art, not a science. This is because everyone’s goal will be different and what drives each of us into taking massive action to reach our goal would be different as well, therefore, everyone’s goal setting strategy would be unique. Your goals will be different than mine. And what drives you would be different from me. Yes, be prepared and get ready. This is going to be amazing, and this is going to be excited. If you have never set any goal before, this is going to be awesome for you. If you have set goals before, this could be something new to you as well because we are going to do this as serious as possible. What we are talking about here is about living the life you want, and it is about accomplishing the outstanding success you want in life. This is a very meaningful and important topic of your life. Sadly, the majority of the people out there don’t even spend an hour to think seriously about what they want in life. Most people will spend days or even months into planning for their vacations. They do research, check the web, read books and ask around to get more information about travelling to other countries. Yes, I understand that travelling is exciting especially to a place that you have never been before. However, planning for travel is not going to be as important as planning for your life, right? Thus, you should be spending more time and effort into planning your life. What we are going to do here is to set some important and exciting goals that will totally change your life. So I hope that you are convinced that goal setting is something important to you, and you should treat it seriously. Are you ready? I don’t know how long this process of setting your goals is going to be for you. Some people take 30 minutes; some people take about an hour, and some may take longer than an hour. Hence, you have to get ready and make sure you free yourself for as long as you need. My suggestion is that you can do this at night. The best time would be right after your work. If it is a weekend, great, you can do it anytime you want. Just make sure that you plan enough time for this. Sometimes you may want to block out more time for your goals. Remember, we’re talking about planning for life. It is much more important than planning for a 3 days trip, eh? You are going to need pens, preferably with different color. You will also need a notebook to write down your goals. Don’t use an Ipad or type down into your computer or your mobile phone. You want to “feel” and experience the process with maximum impact. So writing down into papers and notebook would be the best way for this. Notebook – You can just pay a visit to your local bookstore to get one. I would suggest you to “invest” more into this since this is going to be your personal journal. You will want to record down your goals, your thoughts, your ideas and whatever lessons you have learned into this powerful little book. Time – Set aside at least 1 or 2 hours for this. Anthony Robbins wrote down his goals in an old Russian map while he was on the train travelling to Siberia. He took as much time as he could and invest his time into planning and creating his destinies. You should do this as well. To be honest, you don’t have to be too choosy on where to write down your goals. Just get yourself a journal or a notebook to write will do. Alright, after going through all the preparation, you’re going to finally set your goals. There will be a lot of arguments and debates as some of the principles for goal setting would be quite subject, and it is quite personal as everyone’s goal will be different. One of the most disputable ideas would be whether your goal is attainable. Like what I have said, everyone is different and whether your goal is attainable will be totally up to you. For example, can you set a goal as to make a million dollar within a month? Some people may say that this is not possible, but for some people who already have the resources and know-how, they can achieve this goal. Another example is when you wanted to climb up in the corporate ladder. Some people find themselves complacent in being an employee because they think it is difficult. However, striving people will meet a goal such as finishing a Deakin University leadership degree to obtain skills and knowledge they need to get promoted. I first learned this idea from Brian Tracy. It is a very powerful principle in thinking. What this tip suggest is that you have to adopt the blue sky thinking and assume that the sky is the limit. Whatever you want to accomplish would be possible for you. Never have doubt, don’t feel uncertain, and never hesitate about what you can achieve in your life. Whatever that comes to your mind, you can just write them down. “If every attempt I take will be successful, what would I do? You can write down whatever thought that comes into your mind. It can be in one paragraph or story form, or you can write down in list form. Remember, the sky is the limit, and you must never have doubts with your goals at this stage. All you need to do is keep writing and continue to write for as long as it takes. This exercise is to generate your vision about your future. Whatever you want to be, do and have in both the long-term and the short-term. Just write down everything will do and take as long as you need for this. What you need to do here is to imagine your long-term goals. If you have written down all the goals from the previous step, all you need to do now is to categorize your goals into long term and short term. Long term goals can stretch up to 20 or even 30 years. I seldom see people imagine their life for more than 50 years; it will be a very LONG-term goal, and you will need more than half of your life to achieve this 50-year goal. Most people will just have a vision for their life in about 20 to 30 years, which is just nice. Long term goal will be just a guideline because it takes a long time to accomplish and we cannot predict exactly what is going to happen in our life. It can be vague, and the main reason for long term goal is to give you a vision of how your future is going to be like and how you want your life to look like. Usually, your long term goal will never run too far off from the reality when you reach the time frame. Important for your 1 year and 3 years goals. You have to be more specific with goals within these time frame. As they are shorter, thus you have to be more specific, especially your 1 year goals. Remember, your long-term goals will serve as the vision for your future. Just imagine things you want to achieve in your future and write them down. Short-term goals are important as they are the ones that will determine your immediate results. Most people give up and quit because after they have put in the effort and they don’t get the results immediately. Never let this happen to you and this is how your short term goals can help you. When you set your short term goals, commit to them, do whatever you can and try your best to persist until you reach the time frame. For example, if you set out to lose 10 pounds within 3 months, and after a month you have only lost 1 pound, you should never give up. Instead, you should look at your strategies and your actions. Are you doing the right thing and taking the right action? You have to persist on for the next 2 months and do your best to achieve your target. Short term goals are like milestones. They served as the way point telling you whether you are travelling in the right direction. Your short term goal should be exciting and able to drive you when you think about reaching them. Short term goal can be as short as days or weeks and maximum of a year. I have my monthly goals with me all the time. I know exactly what I need to do and accomplish by the end of every month. This is how I can make sure I can hit and achieve the results I want. As an example, I know exactly how many articles I need to write and publish in this blog. I know when should I publish all my articles and what should I do to promote them. I laid down my plan and followed through. You are going through the planning phase right now. And planning usually only takes once, and the rest would be to focus on taking action. You can change your plan and amend here and there, but your goal should be the same. You can change your goal as well, but if you do that, all the previous effort which you put in will be wasted. Like I said, this is going to be personal and subjective to each person’s requirements. I’m more focus on financial and career. However, I will make sure I have some level of satisfaction in the areas of family, home, health, mental and education. In fact I read a lot of books and one of my goals is to read at least 2 books each month. It will be difficult for you to keep balance in all the 6 areas. It depends on your age as well. if you are at age 20 to 30, most likely you will focus more on finance. And if your age is around 40 to 50, mostly you would put in more focus into physical and health. These are just guidelines and tips that help you through along your goal setting journey. Now, there is another way of goal setting, which is explained thoroughly by Vishen Lakhiani from Mind Valley. It is is an interesting way to set your goals. Vishen explained that most of the goals that we set in our life were not what we wanted. Instead, they are the means goals and not the end goals. The means goals would be something like making money, losing weight, driving a luxury car, etc. These are what the society has programmed us to achieve for. We tend to set our goal as to make money, but in fact, money is not the end, it is the means to an end. Why do you want money for? Or why do you want to drive a luxury car? A normal car can get you to where you want to go just like the luxury car. Most people are chasing for the luxury car because they want the feeling of satisfaction, proud and they want to prove to others that they have done it. And these feelings are the end goals. The luxury car would be the mean goal. Now, I strongly recommend you to go through the sharing from Vishen from Mind Valley. Learn his technique to goal setting through asking yourself 3 important questions, what do you want to experience, where do you want growth in your life, and what do you want to contribute to the world. These 3 questions and his way of focusing on the end goal will open up your mind and boost your creativity to another level. Remember, you want to have both end goals and means goals. End goals are usually emotionally connected to you while means goals are more like physical items. Combine all the tips here and find out what will work for you. You don’t have to make it complicated as goal setting should be simple and something easy to do. Like I said, in fact, you don’t have to follow through exactly what I have shared here. Your goals will be personal to you, and there is no RIGHT way to set goals. As long as your life purpose is clear, you have a vision, and you know exactly what you need to do to achieve greater success in life, that will be great enough. Very useful information. I will definately start setting goals this way step-by-step.And also setting goals in that 6 important areas of life. Hi Rahul, thank you for that. Yup, should start to set your goal as early as possible and do it in the 6 areas of your life.